Ever heard of horseback archery? If not, you’re not alone! Neither had we until a few years ago when we had an introductory lesson at our riding club out in France. 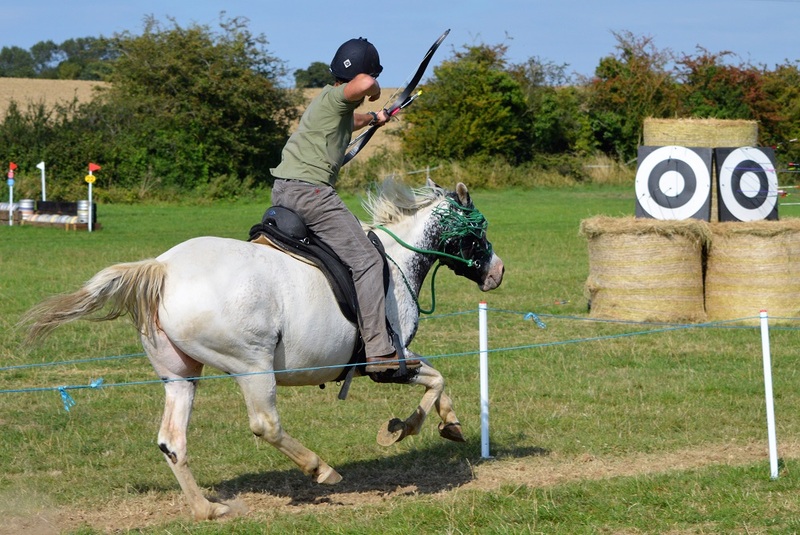 We were instantly hooked and when we moved back to the UK we got in touch with the British Horseback Archery Association to find out more. Since then we have been practising regularly and taking part in competitions both here and abroad. We have trained our horses for the sport and started our own club. We now have two qualified BHAA Coaches and most of us train and ride our barefoot horses bitless and use treeless saddles. 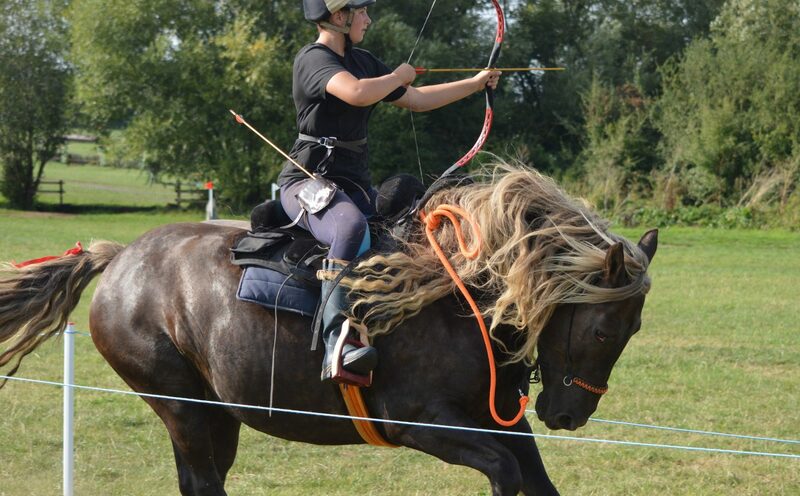 Horseback archery is an ancient art that has developed into a modern sport. Mounted archers began to replace charioteers at the end of the Bronze Age and on into the Iron Age. The Assyrians are widely credited as the first to take it up, when they began hunting from horseback with a bow. The Scythians too were one of the early people to master the art of mounted warfare, they seem to have been spread across a large region north of the Black Sea and their land may well have reached as far as the Caspian Sea. The peoples of the Asian steppes, most notably the Monguls under Ghengis Khan, perfected the art of mounted warfare over the centuries. In Japan, meanwhile, from about the 4th century AD, Samurai warriors developed their own form of mounted archery, yabusame, using tall asymmetric bows, and they still shoot in this traditional way in Japan today. 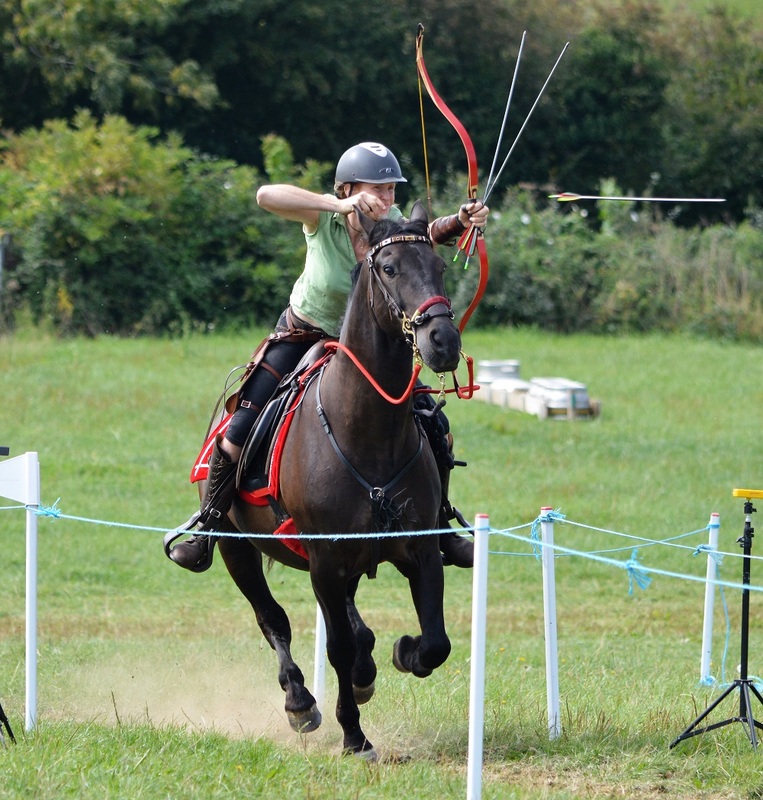 Several distinct styles of horseback archery originating from different parts of the world form part of the modern sport. The Korean track requires the archer to shoot at targets positioned low down only a few metres from the track, whereas the Hungarian style has higher targets grouped together requiring longer distance shooting over constantly changing distances, demonstrating skills that would have been needed in the past for mounted warfare. The Turkish Qabaq event involves shooting a target high overhead with blunt arrows and perhaps the most fun event is the Polish hunt track, simulating a hunt with a long winding course, shooting at targets (often 3D animal targets) which can be at varying distances on both sides of the track. Some of the appeal of this fast, exciting sport for us is the freedom it gives to our horses. They are not only ridden with no contact, but without reins at all most of the time. 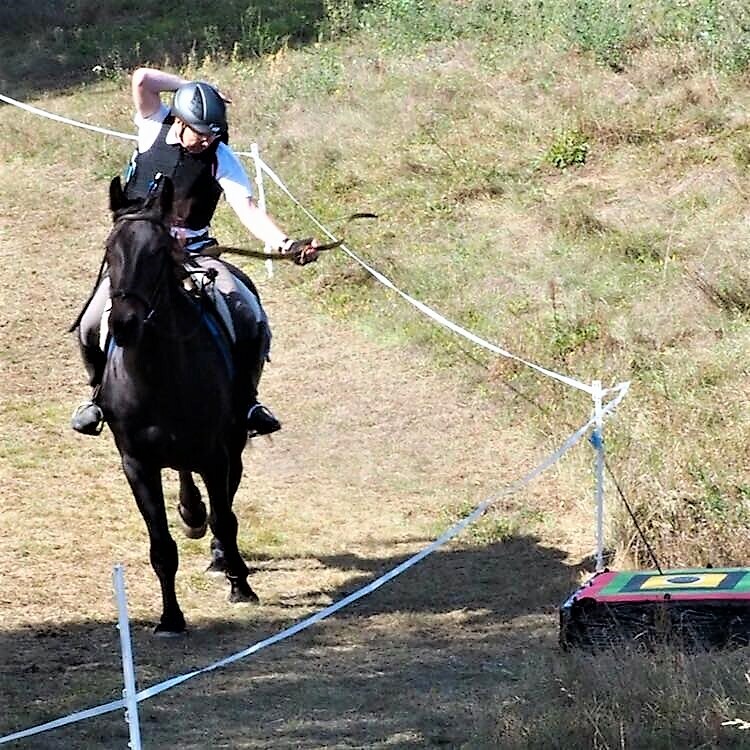 Most horseback archery tracks are run over 90 metres, with targets at regular intervals alongside, and of course the horse needs to be ridden without reins as you need both hands on the bow. When we do need to use the reins, we have taught all our horses to neck rein, so we can easily move them down to the start of the track when we have a bow and a handful of arrows to deal with! We train them to follow voice and seat cues using positive reinforcement and to be responsible for maintaining their speed and direction with minimal input from the rider. 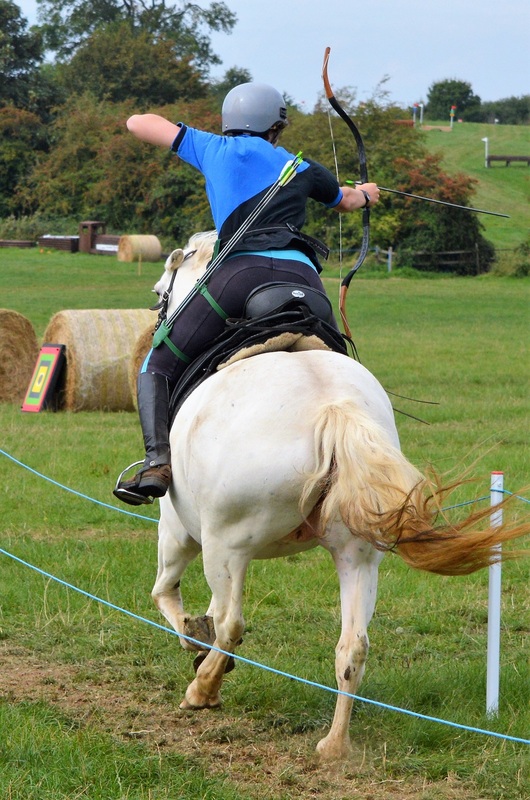 If you’d like to find out more about the sport, get in touch with the governing body in the UK, the British Horseback Archery Association (www.bhaa.org.uk) and they can put you in touch with coaches in your area. The sport is rapidly growing in popularity and new clubs are starting up all the time. If there isn’t a club near you, there’s no reason you can’t start one up once you’ve done the necessary training, again there are details of how to do this on the BHAA website. There is a qualification and grading scheme for horseback archers, so you can see the progress you have made and also a postal match system so archers can compete against those at a similar level across the country and around the world. So what’s stopping you?